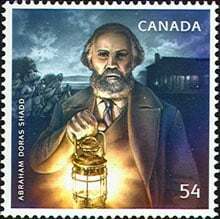 On February 2nd, 2009, Canada Post began issuing a stamp commemorating Abraham D. Shadd (1801-1882). Mr. Shadd was born in the USA, but moved to Canada in 1851 from Pennsylvania. In his native America he had been an instrumental leader in the fight for civil rights for African Americans, and he opposed the colonization of Africa. Mr. Shadd earned his living as a shoemaker, but was tireless in his efforts to work with the Underground Railway, and participated also in the founding of anti-slavery societies during his lifetime.After moving his large family to Canada, Mr. Shadd continued his anti-slavery activities. He also became the first black man elected to political office here, becoming Counselor of Raleigh Township. Introducing our new US stamps section!